Looking beyond touchscreens, an alliance of companies including Synaptics and Texas Instruments is trying to exploit unused surfaces to make smartphones interactive and easier to use. The companies on Monday announced a concept smartphone that users can interact with by squeezing and tilting it, the companies said. Interacting with the phone usually occupies both hands, but the Fuse concept phone makes it possible to select and load applications using just the one hand holding the smartphone, the companies jointly said in a press release. The phone's input functionality is based on accelerometers and sensors that make single-handed interaction possible, the company said. Users can tilt the phone up and down to navigate a list of applications and squeeze on the sides to stop the scrolling. Rolling the finger on the back of the phone helps select an application, and squeezing it can start the applications. This reduces the need for placing the finger on the touchscreen to run applications, Synaptics said. There are force and capacitive touch sensors on the sides of the phone that enable directional panning and scrolling. The phone also has accelerometers and haptics technology on the front glass and the sides of the phones, Synaptics said. The phone looks like a conventional smartphone. It has a 3.7-inch high-resolution AMOLED (active-matrix organic light-emitting diode) screen that can display images at 480 by 800 pixel resolution. It also includes a multitouch touchscreen interface. The OS and 3D interface were developed by companies including TheAlloy and The Astonishing Tribe. Fuse runs on an Texas Instruments' OMAP 3630 processor. The application processor is based on Arm's Cortex-A8 design and includes a PowerVR SGX graphics core that is capable of 2D and 3D graphics, according to a reference design on Texas Instruments' Web site. Synaptics declined to comment on the operating system running in the phone. This phone is a prototype and won't be available on the market, a Synaptics spokeswoman said. It is intended to be a concept design for other companies to reference when developing smartphones. Fuse is a follow up to the Onyx smartphone, a concept handset designed by Synaptics and other companies in 2006. Onyx offered a capacitive touchscreen as an alternative to keys for users to interact with smartphones. The touchscreen concept has caught on, though some technologies, including answering calls by placing the phone on a cheek, have not yet reached smartphones. Synaptics doesn't develop smartphones. The company is most known for developing input technologies for mobile devices and laptops, including touchscreens and mousepads. 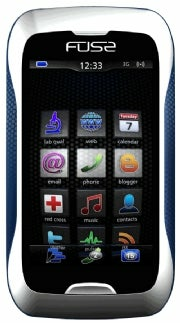 The Fuse phone will be on display at the Consumer Electronics Show in Las Vegas between Jan. 7 and 10, Synaptics said.